Driving a motorhome while towing a car can be an adventure all in itself, we’re about 45 ft long and can’t back up. We need to plan well ahead and rely heavily on a TomTom GPS to keep us out of trouble, which it does… most of the time. Our first Canadian "adventure" occurred after seeing a reader board stating Canada Highway 1, our planned route, was closed. We got off Hwy 1 in Hope, BC and our trusty TomTom GPS quickly found an alternate route giving us instructions to drive around the block in order to turn around. What it didn’t know was that there was a Canada Day parade crossing this new route. We managed to avoid joining the parade but it appeared we’d be stuck in the surrounding traffic for hours. However we were grateful for generous and patient Canadian drivers who encouraged us to pull out in front of them. After many weeks of "killing time" in western Washington and Oregon we were so excited to finally be on our way to some real adventures in Canada and Alaska. Our plan was to head directly toward Alaska and spend more time in Canada on the way back to the US. 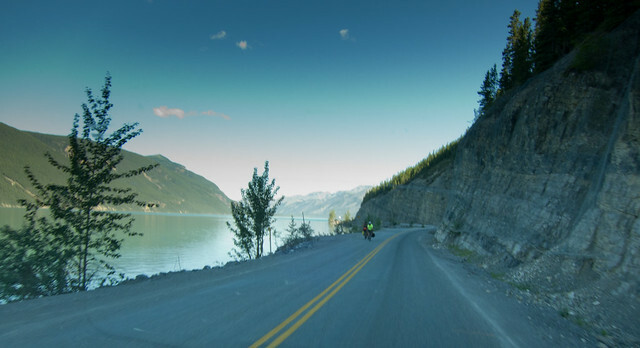 Once we entered Canada we headed directly north passing through St George toward the Alaska Highway on our way to Yukon. Canada is huge so we did a lot of driving that first 2 weeks and very little hiking. 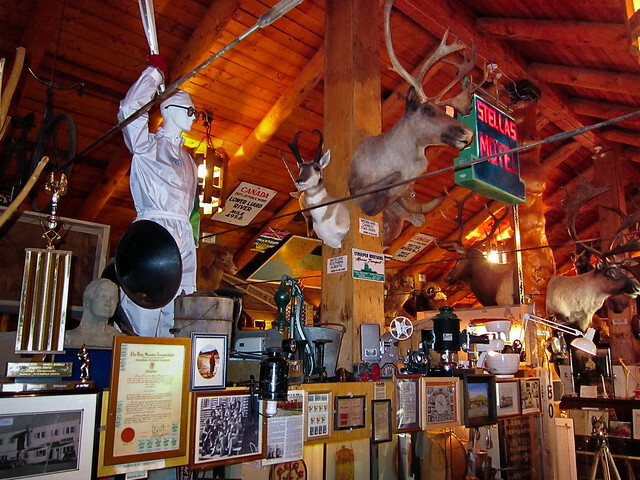 We stopped briefly in Fort Nelson in British Columbia and learned a great deal about early settler life and the construction of the Alaska Highway at the eclectic Fort Nelson Museum. We did take a short break from driving and spent 2 days at Stone Mountain Provincial Park, located within the Northern Rocky Mountains. 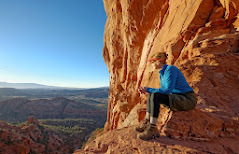 We hiked up nearby Summit Peak for some spectacular views as well as an "orientation" to hiking this far north as we experienced the expansiveness and intensity of the terrain and weather for the first time. We turned back short of the summit as we encountered the strongest winds either of us had ever experienced. Frequent gusts felt as though they could lift one off the ground and forced us to stop and brace ourselves just to stay upright. We also did a day hike to nearby Flower Springs Lake through beautiful mountain meadows and rocky passes to 3 brilliant turquoise lakes. I’ve heard this area described as “Montana on steroids” but even that doesn’t capture the sensation of being so small and inconsequential in country this expansive. 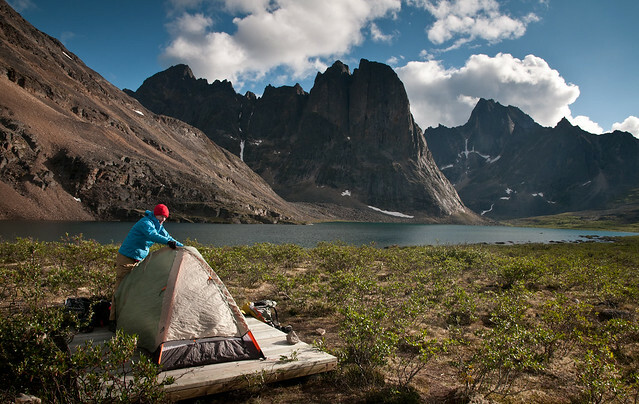 Our Stone Mountain Provincial Park photos are on Flickr. 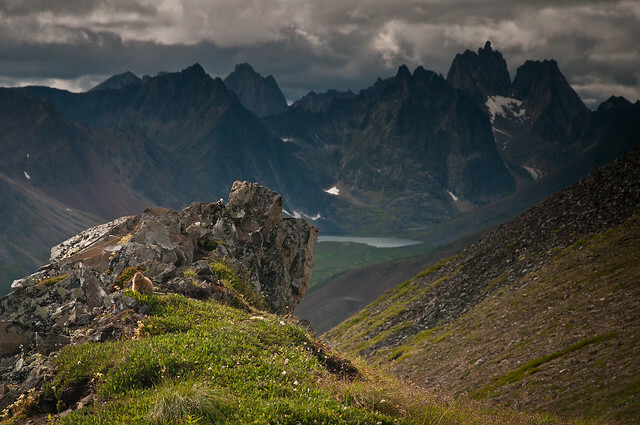 As we were now in “Bear Country” we had started carrying bear spray canisters but were surprised to encounter a group of 7 individuals led by a rifle toting guide. I assume it was for protection from bears but I’ve read that more people are injured by bears wounded by bullets than by bears who have been pepper sprayed. 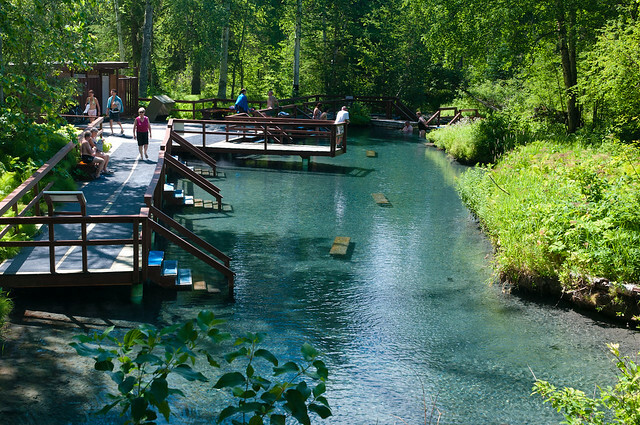 Just before leaving British Columbia we stopped at the Liard Hot Springs, apparently a very popular destination for many, and we spent an afternoon steeping in the hot sulfured water. 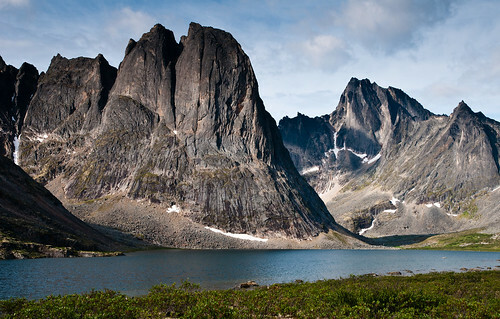 ... and the Tombstone Territorial Park, with its jagged peaks, alpine lakes and expansive views of arctic tundra, is a prime example. We planned to do a 4 day/3 night backpack trip In Tombstone. 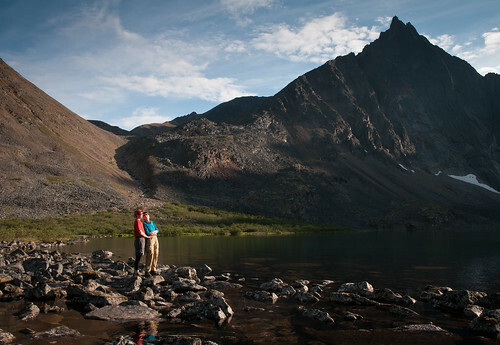 We headed up Grizzly Creek and stopped at Grizzly Lake the first night. 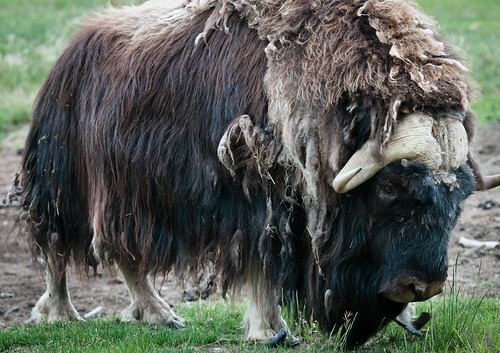 There are established camping areas complete with wood tent pads to prevent damage to the fragile tundra. To help reduce issues with bears there are also separate cooking tents and bear boxes provided for food storage. The weather had been unsettled; cloudy and windy. Early the next morning there was some drizzle but it cleared up by the time we got going although it did remain windy. Our route would take us over Glissade Pass. 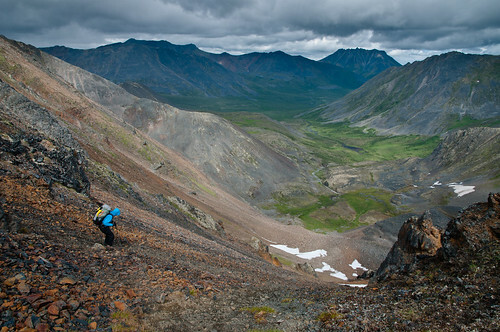 The way up from Grizzly Lake was steep and grassy but we encountered steep, loose scree on the way down the other side. It wasn't as bad as I had anticipated as we were able to comfortably "plunge step" for much of it. 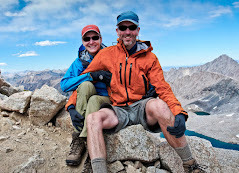 We intended to camp that night at Talus Lake and see Tombstone Mt, the highest peak in the park. But the route and terrain proved to be more challenging and slower than we had expected so we opted to stop and camp at Divide Lake. That evening we did hike up a ways and got this distant view of of Tombstone Mt. We decided we could stretch our food and stay out an additional night in hopes we could dayhike to Talus Lake and get a closer view the following day. However, the next morning we woke up to very windy rain. 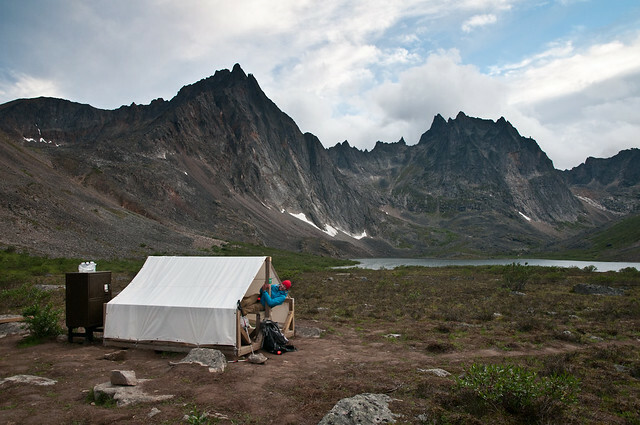 We had the choice of staying in camp, spending the next 24 hours huddled in our small tent, OR hiking up to Talus Lake as planned in hopes that the weather would break. We chose to hike and hope but unfortunately the weather didn’t break. We didn't have a map but the route was quite clear for long stretches. However, later in the day it would frequently vanish into thick brush and marsh. This day became our standard of comparison for misery. 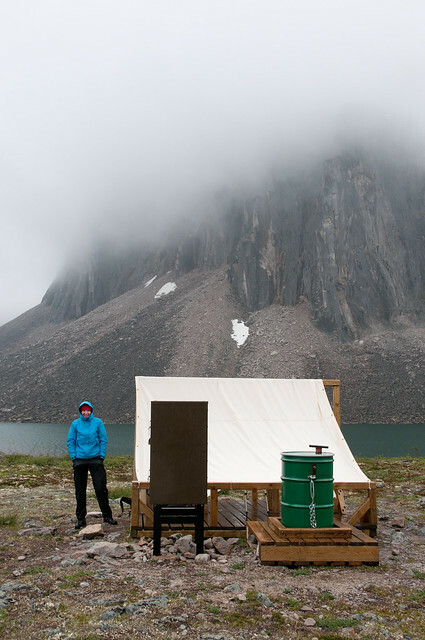 Once we got to the lake we stopped briefly and sought shelter in the cook tent in order to eat but we were both cold and needed to keep moving. 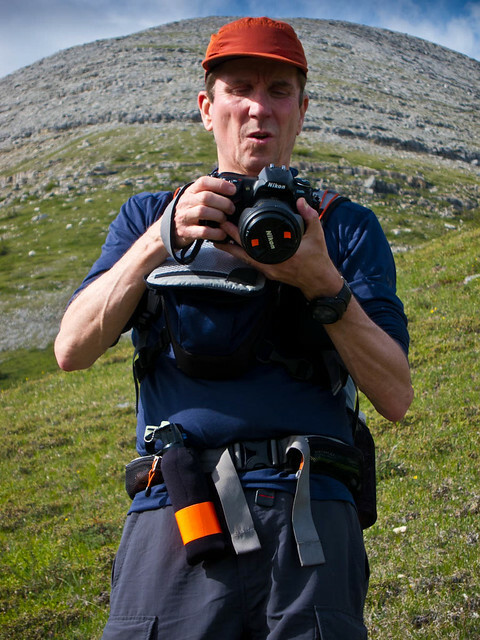 I had been able to stay relatively dry but John became quite wet and in danger of becoming hypothermic. We zipped our sleeping bags together and I got the "opportunity" to provide John with a necessary source of heat. But despite the discomfort I believe we both would have preferred hiking that day than staying in the tent. Besides it is experiences like this, once you forget just how uncomfortable you were, provide some of the most vivid memories. The next day the weather had settled down and was dry and less windy. However, neither of us was up to hiking back up to Talus Lake before heading out. As I has suspected it was time consuming to get back over Glissade Pass. 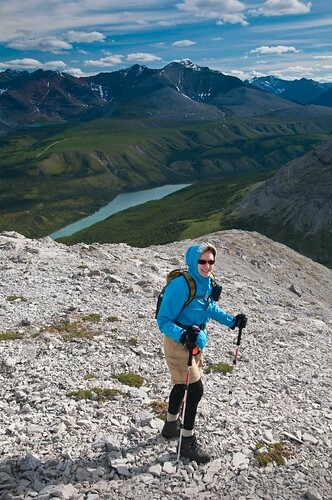 Hiking up the loose scree involved a lot of "two steps forward, one step back". 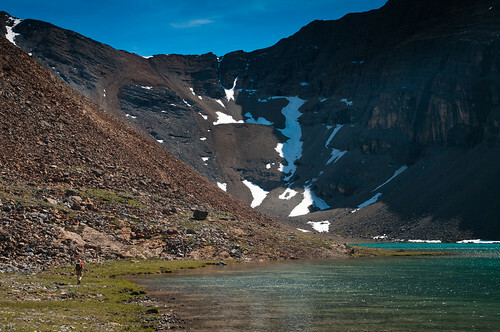 Once we got over the pass I was happy to see Grizzly Lake, where we would camp for the night. Fortunately the weather became quite lovely that evening and we thoroughly enjoyed our last night out. 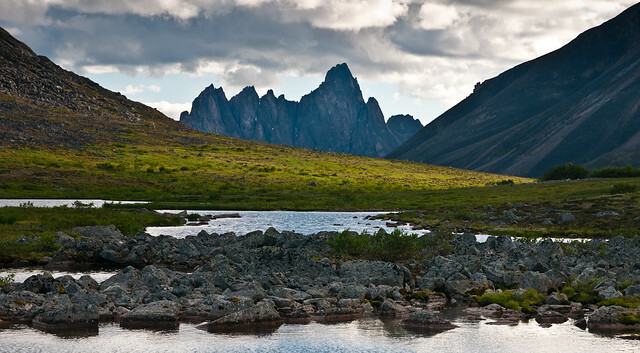 Our Tombstone Territorial Park photos are on Flickr. ... which we didn’t. The far northwest has been experiencing the coldest wettest summer that locals can remember. Oh well. 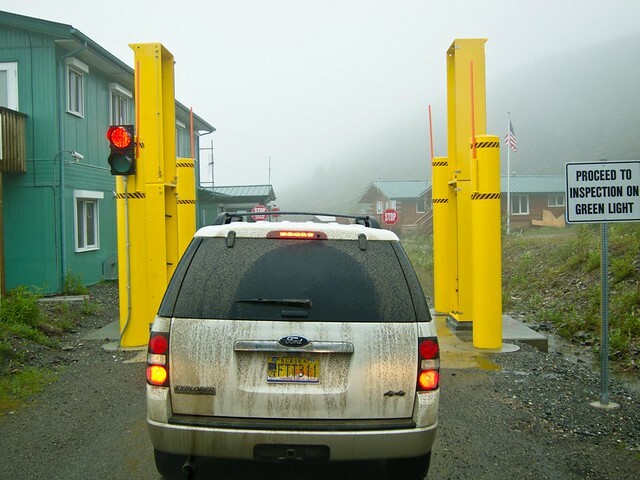 We reentered the US at Poker Creek in Alaska, the most northern border crossing between the US and Canada. Now on to Denali! 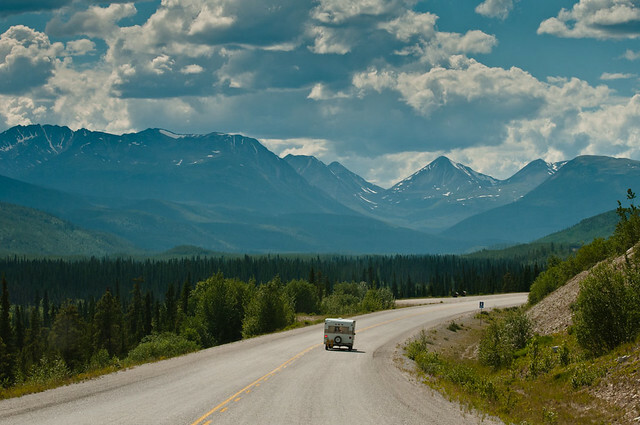 We knew that traveling through northwestern Canada would require a great deal of driving on the Alaska, Klondike, Dempster and Top of the World Highways. These highways were not constructed to be scenic byways but the expansive views from any of them can be stunning. We drove past vast tussock covered muskeg flat lands, rolling spruce covered mountains, the rugged Northern Rockies etc on our way north. These highways can also be amazingly good for viewing wildlife. 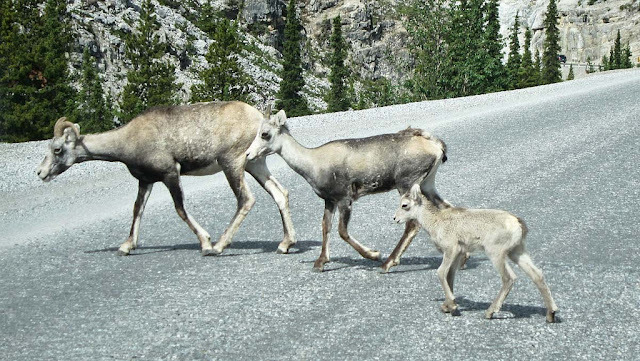 We saw caribou, Stone’s sheep, moose and 5 black bears either along the side of the road or, in several cases, right in the middle of it. Constructing these highways were enormous undertakings and, all things considered, the surfaces are remarkably good. 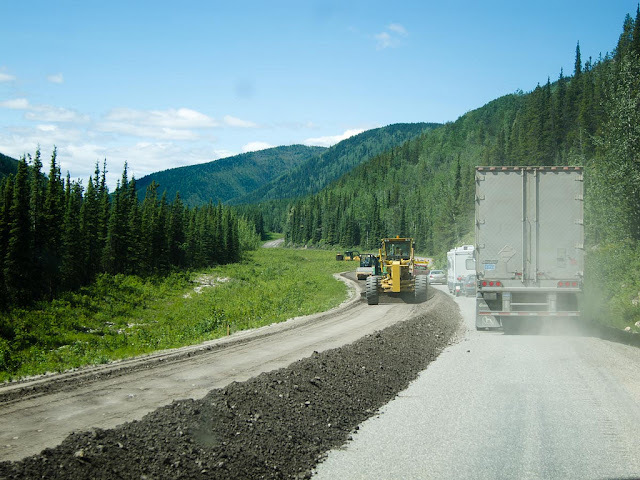 However, this is a challenging environment for any road surface to survive and all highways in northern Canada undergo continuous summertime repairs. We drove many a mile bounding over frost heaved roads, dropping into potholes, skittering over “washboard”, sticking in fresh tar, plowing through deep gravel, enduring choking dust and waiting in long lines through one-lane construction zones. Needless to say this was hard on our motorhome, our car and us. All that mud and gravel being kicked up by our motorhome and every passing vehicle thoroughly trashed the Subaru’s windshield. 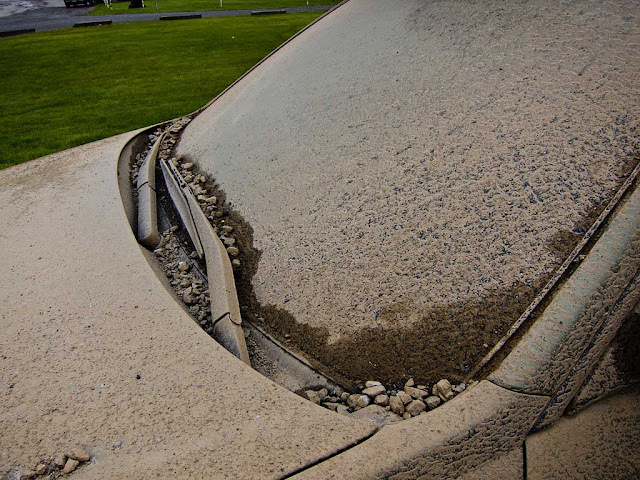 It acquired countless dings and chips as well as four sizable cracks. The poor road conditions, especially when combined with wind and rain, caused a great deal of driver fatigue. Inside the cab the continual vibration of all of our possessions; microwave, stove, monitor, pots and pans etc, and the resulting noise caused auditory fatigue so rest breaks were important for a little peace and quiet as well. Our daily mileage was less than we had hoped so we spent more days driving than we originally thought would be necessary. I admit that in weak moments I have wondered if it was all worth it. But of course it was. It was what we had to do to get to places that are still this remote, this unpopulated, this huge. 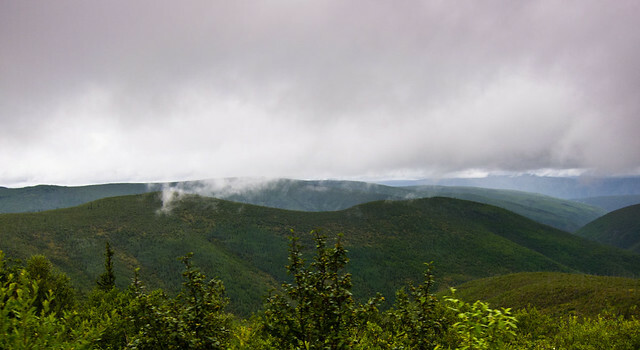 It is what’s necessary to fully appreciate the open space, the harsh beauty, the intense weather (not to mention every smooth road and every day without pouring rain). And driving these Canadian highways was the only way for us to get to where we wanted to go in the level of comfort and convenience we desired. I foolishly hoped our relationship with highways such as these would end when we crossed the Canada/Alaska border where the Top of the World Highway becomes the Taylor Highway. 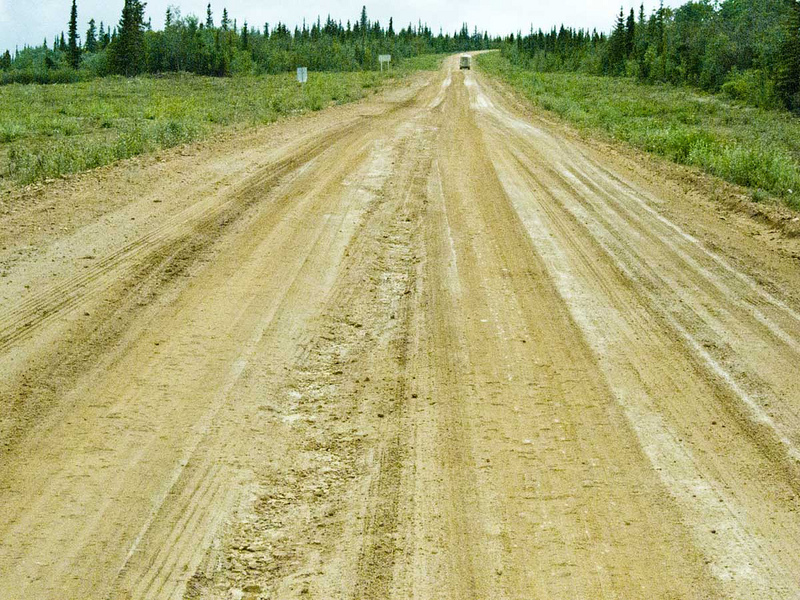 But it appears Alaska uses the term “highway” even more loosely than Canada does. The Taylor is muddy with just enough gravel to keep one from sliding off of it...most of the time (a recent driver is still missing). It had just recently reopened after weeks of closure due to multiple washouts. The day we drove it was cloudy and wet. Heavier rain the next day caused another major washout and it closed again, most likely for weeks. We were so happy we went when we did because it is a very long way to go around it. This Jessie guy is looking a little nappy headed.